Nestled in the beautiful backdrop of the tourist village of Namche, like many other things the Namche Monastery manages to collect appreciation and wonder from most of the people that visit them. 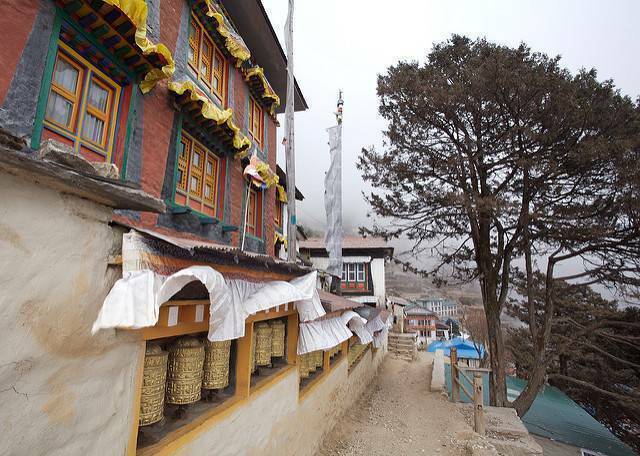 There are 3 major monasteries in Namche. The Namche monastery which is right in the bazaar and the other two monasteries, namely Thame monastery and Tengboche monastery which are both a medium climb from the main bazaar. The monasteries in Namche are like no other monasteries, they are secluded, serene and utterly true to their purpose, it’s a heavenly sight to see when the colorful flags fly in the stark blue skies and the murmurs of the monks flow in the wind fast and gushing through your souls and cleansing you for all other time to come.